In small bowl, combine eggs, milk, onions and salt; beat with fork until well blended. Melt margarine in 9 or 10-inch skillet or omelet pan over medium-high heat; tilt skillet to coat. Pour egg mixture into skillet; reduce heat to low. Cook 5 to 7 minutes or until egg mixture is set but top is still moist, lifting edges occasionally to allow uncooked egg mixture to flow to bottom of skillet. 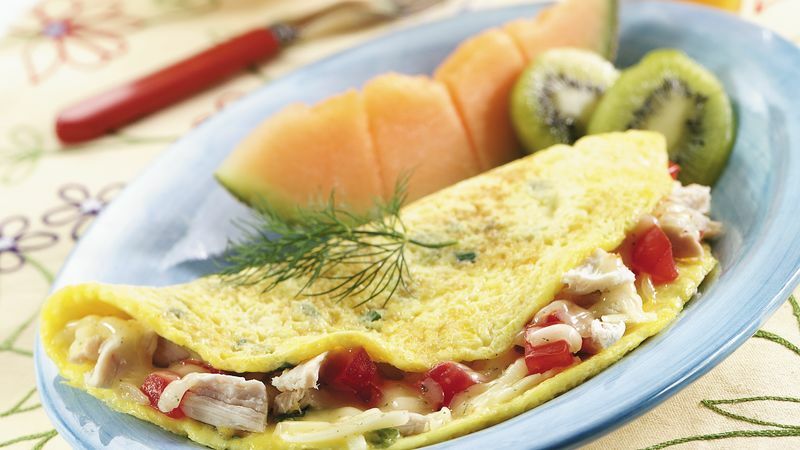 Top omelet with chicken, cheese and tomato. With spatula, loosen edge of omelet and fold in half as omelet slides from skillet to serving plate. Seasoned salt contains salt plus sugar, paprika, onion and garlic. Plain Havarti or mozzarella cheese, plus 1/2 teaspoon of dried dill, can be used in place of dill Havarti. Combine the dill with the shredded cheese. To reduce the fat in each serving of this omelet by about 20 grams, use refrigerated fat-free egg product and reduced-fat mozzarella cheese. Each serving of the lighter omelet contains about 170 fewer calories than the original recipe.